OTS Guardian Full Face Mask | Scuba Center | Designed With Divers In Mind!!! OTS Guardian Full Face Mask... Designed With Divers In Mind!!! With over 60 years of diving experience and having sold almost every Full Face Mask (FFM) on the market, it was easy to see there was a need for something better. A common problem with most FFM, is the seal. The lack of a good seal causes the diver to use air quicker and can interfere with the divers ability to hear if using underwater communications. The Double Seal was specifically designed to allow people with a small faces or a slim face, especially in the temple area, to seal better. The OTS Guardian Full Face Mask is comfortable and is easy to use for anyone. The low profile visor ensures great visibility. The OTS ABV valve helps preserve your air when on the surface. Set up is fast and the hose is on the right side which helps to keep your configuration clean and organized. Diving becomes effortless especially in cold water. The Guardian helps keep your face warm and being able to breathe with your nose helps keep you from getting a dry throat, which is common for divers who have long duration dives. Everyone has a little different face. Equalizing is a challenge for all full face masks... One size does not fit all!. In order to ensure everyone can equalize, OTS has put together an Equalizing Kit which comes with every Guardian full face mask. The kit consists of two bases. One is a standard size without any holes. It can be adjusted up or down to fit as necessary. The other base has two holes which allow for different size pads that can be added. In the event the standard base does not work for you, one of the pads and the other base should fit the bill. 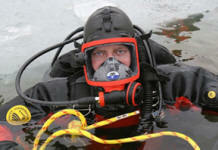 Innovative Dive Equipment began in 2004. Owner Sam Lapinsky is an active Public Safety Diver, and Public Safety Scuba Instructor for a large Sheriff's Department in Florida, and before that a salvage diver. Over the years he had ideas for simple devices to make it easier to complete difficult tasks with a little more ease while working underwater. Innovative Dive Equipment is now bringing some of these ideas to market, hoping that other divers will benefit from their use. Accessory rail system easily attaches to OTS Guardian full face mask and makes it possible to mount various devices to the side of the mask. This version has the “Inodive LED Dive Light” mounted to the accessory slide. This light is rated at 1watt (80 Lumen), and will burn for approx..4 hours on 2 AA batteries. A double O-ring seal, and magnetic switch, help insure the watertight integrity of the light to 150 feet. Other devices can be attached to the accessory rail by adding additional “Universal Slides” (purchased separately). Cameras, lights, and other devices are then changed by simply sliding them on or off the rail.